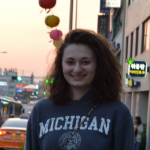 LAURA DZUBAY is an undergraduate studying English and creative writing at the University of Michigan in Ann Arbor. Her work has previously appeared in Bad Pony, Ginosko Literary Review, The Oleander Review, and others, and recent awards for her work include the Caldwell Poetry Prize and a Hopwood Underclassmen Fiction Award. She can be found on Twitter @lauradzu.